Among the many weird and wonderful trends that sweep Japan, there is the square watermelon. What exactly are they? 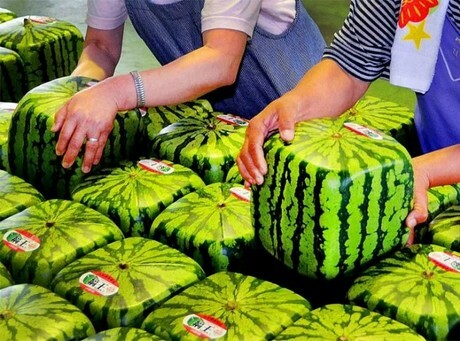 They’re regular watermelons, just grown into the shape of a cube instead of its natural, round shape. Now, you might think that this is completely unnecessary, but square watermelons were invented for a reason. Many consumers seem to have struggled with fitting giant watermelons in their small fridges. Plus, because of its rounded shape, they tend to roll if they’re not strategically placed. So, the solution to that was to make them cube-shaped so they can easily fit inside fridges without any hassle. They’re considered luxury grocery items though, as these square watermelons appeal mainly to wealthy shoppers, and they have a hefty price tag. Worldofbuzz.com reports that according to local food portals, one square watermelon will cost you about RM2,000 (€430,-). Enjoy!